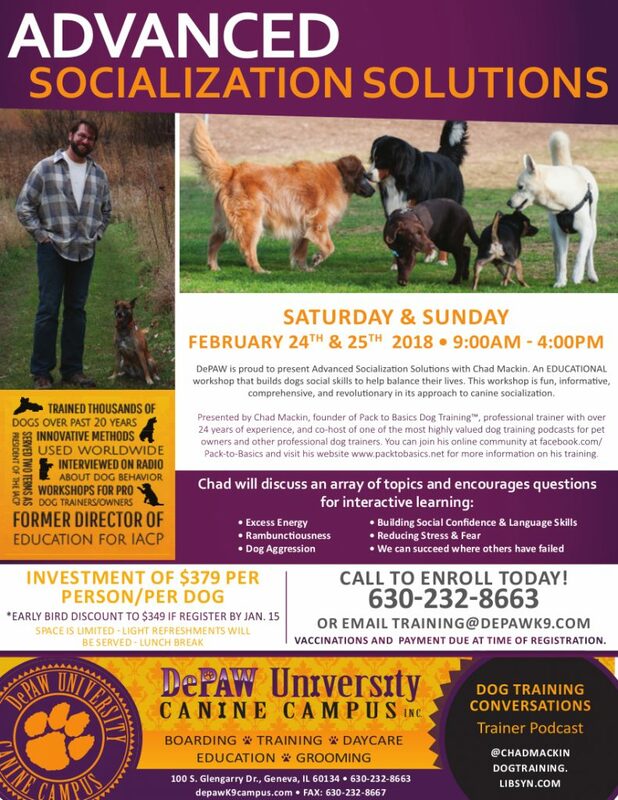 DePAW is proud to present Advanced Socialization Solutions with Chad Mackin. This is an EDUCATIONAL workshop that builds dogs social skills to help balance their lives. This will be fun, informative, comprehensive, and revolutionary in it’s approach to canine socialization. Chad Mackin, founder of Pack to Basics Dog Training, professional dog trainer with over 24yrs of experience, and co-host of one of the most highly valued dog training podcasts for professional dog trainers and pet owners alike, will discuss an array of topics including: excess energy, dog aggression, reducing stress & fear, building social confidence and language skills, and rambunctiousness. Workshop will be both Saturday and Sunday days from 9am – 4pm. Investment of $379 per person/per dog with early bird discount to $349 if register by Jan.15. *Space is limited. Light refreshments will be served along with a lunch break. Vaccinations and payment due at time of registration.